Anna van der Lei presented her “Badkast” a closet shower hybrid at the Design Academy in Eindhoven. The bath features closet doors and a rail to hang clothes. I think another practical purpose would be using the rail as a drying rack for wet clothes that come out of the laundry, and bath towels. The structure itself is made from Larch wood which has a very similar grain to Ash wood. In Finland the sauna rituals have ancient traditions but are still part of contemporary culture. During my childhood summers I always spent two months in “Mökki,” our summer house in Finland. At Mökki the sauna is the only space where you can wash yourself. Beautiful nature and a lake surround this sauna. It is a place of serenity, enjoyment, coming together and relaxing. In those childhood summers I learned that taking a sauna is more than bathing: the magnificent view over clear clean water, the wooden construction with the smell of burned wood, and silence with only the sound of nature. It is not only physical refreshment but psychological refreshment as well. The sauna has two rooms the steam or sauna room, and the dressing room. In the dressing room you dress, undress, cool off, and have chat. In this dressing area the sauna ritual begins and ends. Changing clothes in the dressing area prepares you for a sauna, and fully refreshed you put clean clothes on after taking a sauna. The feelings that I get from a Finnish sauna I wanted to translate into a bathing space that allows for the same feeling but a space that anyone can use. 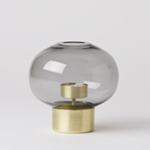 A piece of furniture that can be placed wherever you like; a piece that is part of the house and living room. The Badkast is a combination of a bath and a closet. The bath represents the sauna where you clean yourself and the closet represents the dressing room. The doors at the front of the closet and the backsides can be entirely opened to allow you to feel connected with your environment. Changing clothes, being at peace in your environment, and bathing: a Finnish ritual coming together in the Badkast. 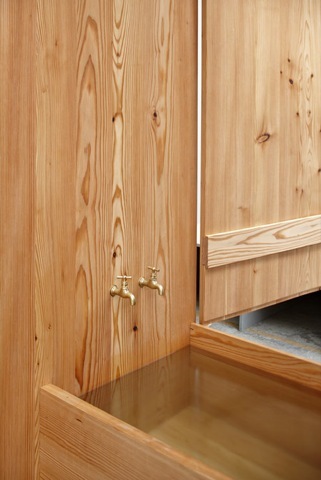 The Larch is chosen because it can be used in combination with water. 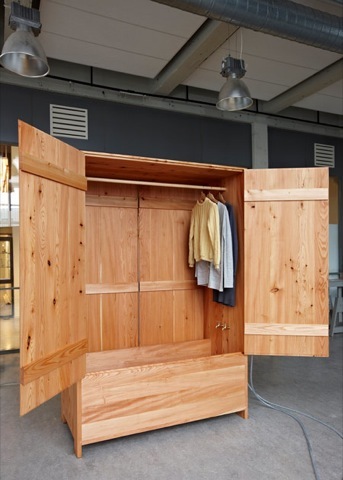 The closet is made out of one large wooden trunk of Larch to make the Badkast the same tone. This trunk has been drying for over 8 years and all the useful parts have been used. The construction is simple but smart. The connections that are used are designed in such a way that allows them to interact with water. Even new type of joins, able to interact with water, were developed for the Badkast. The exterior is simple as well and therefore it fits well in any residence, inside or outside. You give the closet your own colors when you hang your own cloths in it. By opening the doors the closet becomes one with the environment. For me the perfect bath is simple. “Take your time in your own environment”.